Our No. 215 double wire end modeling tool is a traditional mid-size sculpting tool made for working in Plastilina, wax, self-hardening clay, and ceramic (pottery) clay. This delicate tool has two steel wire cutting ends ground to a fine edge. Each wire end has been serrated for use when fine cutting and detail are required. One end of the tool is has the common bullnose shape while its opposite end is more of a round nose shape. 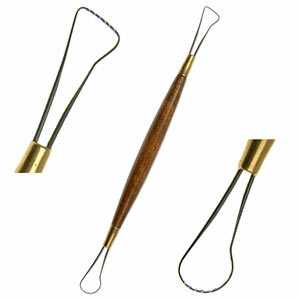 Both ends are securely fastened to a comfortable wooden handle for a smooth grip and ease of use. As with all the tools in this series, I have one for sulfur based oil clays ... been using it for years, and it is perfect! Gets into the tightest crevices, the serrated end pares away clay while the straight ends smooths the clay beautifully. I'm ordering more for my non-sulfur clay.